A video in 2 main parts (broken up into 8 convenient snippets): IST was a trial to investigate the switching of digitally modulated junction circuits. These first parts (1.1,1.2,1.3) personally filmed and passionately narrated by Bob Backway. It follows a tour of the TRL field trial site in St Kilda, looking around the "Tin Shed", the ghost exchange at St Kilda. Shows equipment and field work taking place (before a cleanup). This footage was taken at the end of an era, both for the Research Laboratories and for Telecom Australia as a whole. The IST project remains the greatest single undertaking of the Research Laboratories to this day. Started by Harry Wragge, Greg Crew and Fred Symons around 1968 the project commenced field trials at Windsor Exchange in August 1974. The trial involved switching live traffic as part of Windsor Tandem between Clayton (Xbar), South Oakleigh (StepxStep) and Gardenvale (hybrid) exchanges. All traffic was trunked to the IST exchange via the newly available PCM (Pulse Code Modulation) technology and switched in its digital form by time division multiplexing. In the late 70's the IST exchange was shifted to St Kilda Exchange and a Remote Switching Unit (RSU) was added to service Switching and Signalling Branch then located at Winterton Rd Clayton. The project was wound down by the eighties but for some reason the IST exchange and the RSU were kept running by a small group of dedicated volunteers until 1991. A project as grand as IST could not simply be turned off and dismantled without a celebration. Some of the company's senior staff had cut their teeth on the project. It was decided to hold a closing ceremony at the site on 27 May 1991 and invite all who had ever worked on the project to attend the festivities. A copy of the invitation can be be seen here. Around 100 of a possible 500 or so staff attended and a great time was had by all. A highlight of the event was a new fangled and half working broadband connection to Hong Kong. 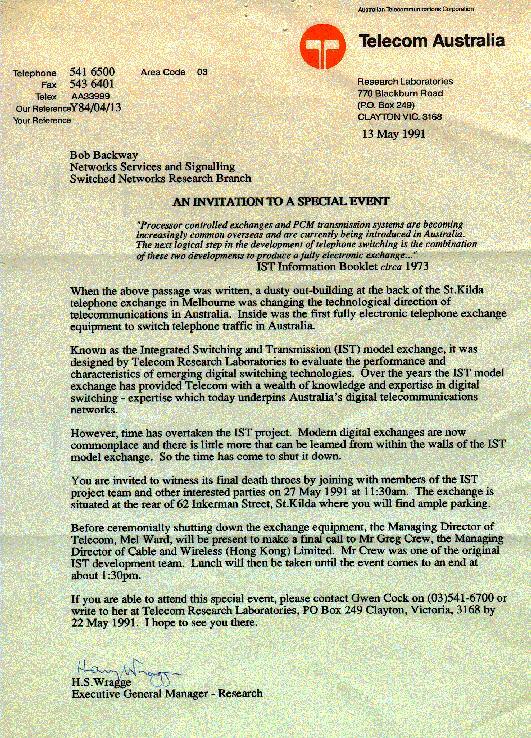 Via this connection Greg Crew, an ex TRLer then in charge of the Hong Kong Telephone Company, and his visitor Bill Craig of Telecom became remote attendees. Executives from AWA were present to represent their contribution to the project - the first integrated circuits made in Australia. Samples of these ICs were handed to attendees as a memento of the event. Soon after this event Telecom and OTC merged to become AOTC, Mel Ward was removed as General Managing Director and the company entered an era of Corporatisation and Privatisation. During the TRL occupation of the tin shed at least two bullets entered the building. Fortunately, the shots were fired over a weekend when there were no staff present. Toward the end there are a few scenes back at the Labs on the 2nd floor of M5. Norm Gale & Peter Gerrand in front of computer room door. Roy Chan & John Hont. Greg Rochlin, Fred Symons with Ernie George in the background. Fred Symons, Roger Smith & Ernie George. Harry Wragge, Howard Fegent in red jumper talking to Peter Botell. Phil Murrell, Sue ??? shakes hands with John Hont. Norm Gale, Peter Gerrand & Jim Vizard looking down. Jim Park on right. Geoff Champion & Sam Doville entering. Simon Chalk in red jumper. Kevin Clark & Roy Chan with John Emptage over his left shoulder. Henk Meijerink, Phil Jackson & Peter Ellis. Out of focus Frank Eastaughe. Peter Ellis profile and Phil Jackson. Too close in on Greg Rochlin. Ernie George & Bernie Sanders with Ian McFarlane in cot between them. Outside we see Bernie Sanders, Sam Doville, Ron Haylock, Bob Backway, Kevin Clark, Ernie George. Ian McFarlane and Bernie Sanders. In computer room (possibly) Robin Court arranging Hong Kong connection. In cabinet room we see Mel Ward towering over Fred Symons and many others already mentioned. Zoom in on Harry Wragge & Fred Symons. Harry Wragge talks to the guests and, via broadband connection, to Greg Crew and Bill Craig in Hong Kong. Jim Vizard talks to the guests, Mick Hunter, the person responsible for keeping this exchange alive for the past 10 years comes to the door to listen to Jim. Then back to Harry. Most people already mentioned (above) except for Neil Chandler who is standing next to Barry Gilbert. Harry Wragge talks to Greg Crew in Hong Kong. The note stuck to the window is a dedication to Kevin Anthony Curley. Kevin was the Senior Technical Officer who oversaw most of the construction of the project and kept many a young Technical Officer in line. A war veteran of the Kadoka trail and a very heavy smoker, Kevin died of emphysema about 1976. Shots include Ami Evin-Chaim and Norm McLeod. Thanks to Bob Backway for loan of video from his personal TRL History collection, his recollections and descriptions above. Thanks also to Rinus Valk for the initial identification of some ex-TRL staff.